Peel Vets|Advice|Equine|Equine Metabolic Syndrome (EMS) – What is it and What can be done? 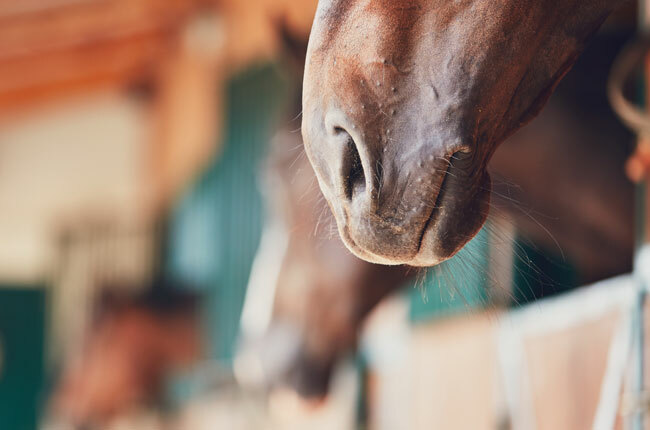 Equine Metabolic Syndrome (EMS) is a syndrome of horses who are often overweight or obese (either in certain regions of the body or generally), have high levels of insulin in their blood stream and as a result, often suffer from laminitis. It is thought to be responsible, at least in part, for up to 90% of laminitis cases where no obvious alternative cause is present (eg. colic, inflammation, excessive consumption of concentrates, etc.). It is not true that all overweight horses have EMS, but in those who have laminitis, EMS should be considered. As mentioned above, the areas where fat is laid down can be local, such as having a cresty neck, rather than all over the body. It can also be difficult to identify the cause of the laminitis in horses and sometimes there are multiple causes, for example PPID/Cushings disease, which is the other common hormonal cause. For this reason, it is very difficult to determine the exact percentage of horses with EMS. It is thought that EMS develops when increased amounts of fat in the body cause insulin resistance, although it is not fully understood how this occurs. It is thought that the body then produces more insulin to try and compensate for this, which causes the body to react less to the insulin, and so on in a worsening cycle. When challenged with sugars, the body produces even more insulin. It is thought that these horses then develop laminitis, especially that associated with pasture, due to blood vessel changes in the hoof and perhaps some other hormonal changes. So how can we test for EMS? Firstly, we will want to examine your horse and assess body condition, usually by body condition scoring. We may then suggest a glucose tolerance test, where insulin levels are measured following feeding with sugar at a set time. We may also want to test for PPID/Cushings disease. How can EMS be treated? The main goal of management of EMS is to make the body more sensitive to insulin again. This is done by adjusting the diet and exercise regime to reduce the body condition. Every horse or pony will be different, depending on any other illness/lamenesses they may have, their previous history and their current diet. Diet and exercise regimes must be tailored to meet these individual needs, but mainly revolves around a forage based diet and limiting grazing and concentrates. This can be challenging and require some significant changes to the way horses are kept. We can also help by identifying and treating any other conditions which may be adding to the problem. This article is not intended to replace individual veterinary advice for your horse or pony. If you have any questions or would like to speak to a vet about EMS, please do not hesitate to contact us at the surgery.